Outstanding Mexican music ensemble delivers authentic flavour of Mexico complete with traditional mariachi costumes. 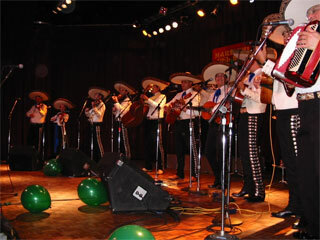 The Mariachi Del Sol is one of Canada's outstanding Mexican Music ensembles. The band was formed by Octavio Carrillo in 1987. It blends the traditional sounds of Mexico, from the soft romantic ballads to lively rancher songs. In September, 1993, the additional talents of Camillo Segundo, Antonio Bernal, Mario Valdez and Roberto Clark were added, and Vancouver, B.C. became the band's base city. Noteable Entertainment & Events is a Vancouver based booking agency, party rental, entertainment services and event production company. If you are interested in booking Mariachi Del Sol please contact us.